SAN BRUNO, CA, March 5th, 2018 — The Sapphire Awards Gala Dinner, held on the night of February 14, 2018, celebrated the most innovative companies in the solid-state lighting (SSL) industry by naming the fourth annual LEDs Magazine Sapphire Award winners. The event, held in conjunction with Strategies in Light, The LED Show, and Lightspace California in Anaheim, CA, aboard the RMS Queen Mary honored the enabling technologies and elegance-of-design in finished lighting products in the industry. 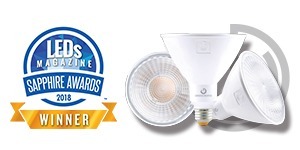 GREEN CREATIVE won its second consecutive Sapphire Award in the Commercial-Quality SSL Lamp Design category. GREEN CREATIVE’s REFINE Series PAR38 17W lamp was selected for its combination of industry leading lumen output, candela and efficacy. This lamp features the patented full-face REFINE optic that provides a high candela to lumen ratio and has typical CRI 90, R9 65 and R13 90 values for applications that demand crisp and vibrant colors. This ENERGY STAR® certified lamp is also suitable for enclosed fixtures. Detailed information and data sheet for the REFINE Series PAR38 17W are available on the GREEN CREATIVE website. 88 companies working across the LED and solid-state lighting sectors nominated over 100 products to be considered for the fourth annual Sapphire Awards, along with outstanding individuals or teams for the prestigious Illumineer of the Year award. 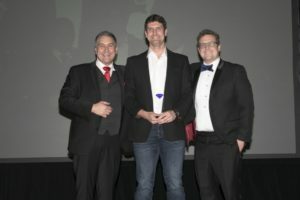 Sapphire Awards judges ultimately considered products across 20 technology categories that covered the spectrum of lighting applications from new categories such as Horticultural Lighting and Smart and Connected SSL Technologies, to classic applications such as LED Drivers and Industrial SSL Luminaire Design. New this year, the judges also considered submissions in project categories for both SSL smart Lighting and SSL outdoor lighting, and a humanitarian award was announced. During the Gala, the best of the best took home the Sapphire trophies after the late-night celebration. Founded in 1910 in Tulsa, Oklahoma, PennWell Corporation is a privately held and highly diversified business-to-business media and marketing services company that provides quality content and integrated marketing solutions for the following industries: Oil & gas, electric power generation and delivery, hydropower, renewable energy, water and wastewater, lasers and optoelectronics, fiber-optics, cabling, broadband, aerospace electronics, LEDs and lighting, fire and emergency services, and dental. PennWell publishes over 130 print and online magazines and newsletters, conducts 50 conferences and exhibitions on six continents, and has an extensive offering of books, maps, websites, research and database services. In addition to PennWell’s headquarters in Tulsa, Oklahoma, the Company has major offices in Nashua, New Hampshire; London, England; Houston, Texas; San Diego, California; Fairlawn, New Jersey; Moscow, Russia; Rio de Janeiro, Brazil, and Hong Kong, China. For additional information about PennWell, visit www.pennwell.com.